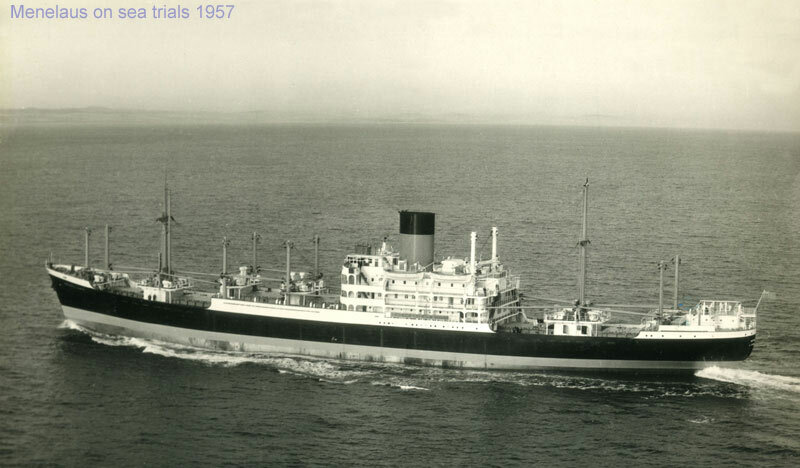 At between eight and eight and a half thousand tons, the new motor vessels "M" class of Blue Funnel ships were more or less the same tonnage as the "A" and "D" boats, but with other differences. For example, they were the first vessels in the fleet with MacGregor single-pull steel hatch covers, and unlike the "A" & "D's" they had four hatches forward of the bridge, and the Sailors House aft was now gone. At 495 feet, they were about the same length as the "D" boats, but about 30 feet longer than the earliest "A" boats. They also had Air Conditioning in the public rooms, saloons, rec-rooms and mess-rooms etc, which was a first for the company. Another first for Blue Funnel, Maron was fitted with data equipment in the engine room, and an alarm systems in the engineers accommodation, this would eventually lead to unmanned engine rooms, and is a wide spread practice today. 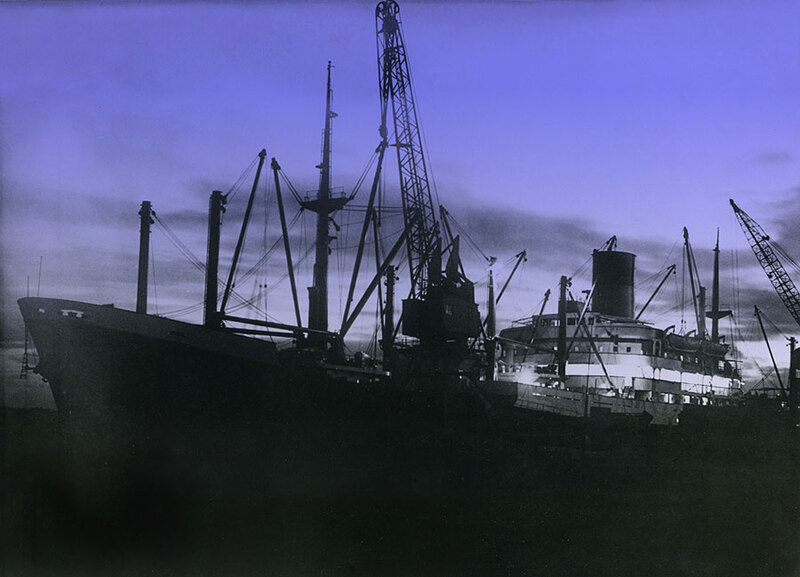 The Menelaus was the first one of six to be completed, in 1957 at the Caledon Shipbuilding Co Ltd, Dundee, Scotland. In fact, four of them would be built at the same yard, the remaining two the Memnon and the ill fated Melampus, would come from the Vickers yard on the Tyne. 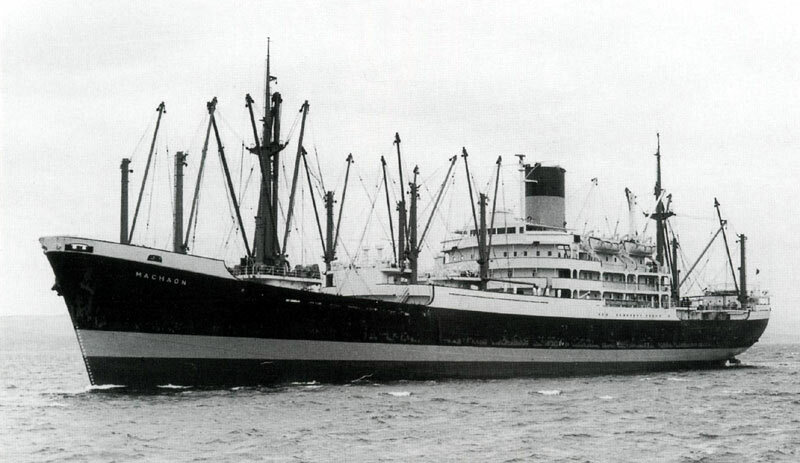 The Maron would be the last off the "Starting Blocks" in 1960. Maron would become the last "Conventional" looking Bluey to be completed. 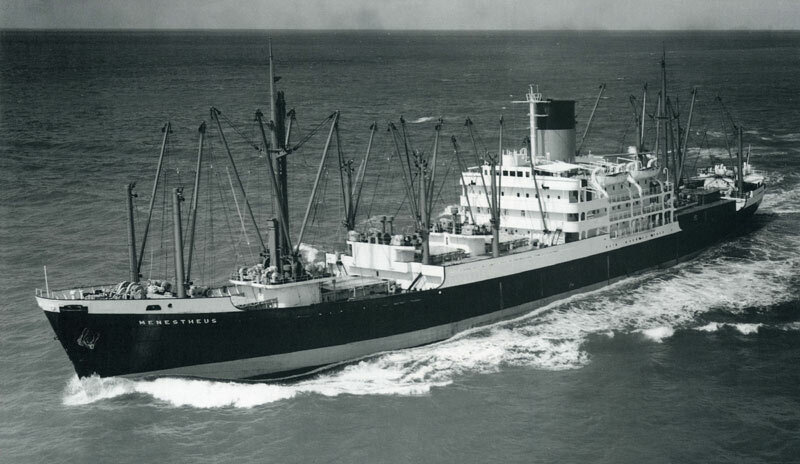 Five of the six ships, had pretty uneventful lives with the company, apart from a couple of name changes in 1975, The Memnon and Maron became the Stentor and Rhexenor respectively, and took over the Singapore to Oz run. And three were transferred to Elder Dempster in 1972, the Menelaus became the Mano, Menestheus became the Onitsha, and the Machaon the Obuasi. And just to complicate things a wee bit further, the Memnon / Stentor became the E D's Owerri, for a few weeks in 1977, and the Maron / Rhexenor became the Opobo, until 1978. 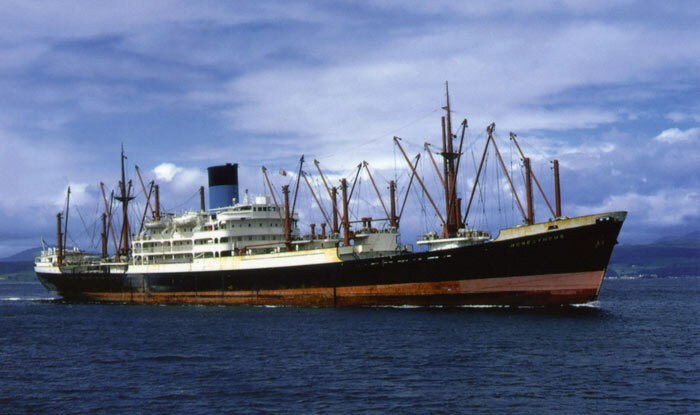 The Melampus on the other hand, had an Egyptian break with a difference, she and the "A" boat Agapenor, along with several other vessels, some British, were trapped in the Suez Canal during the six day skirmish of June 1967. They were to remain there until the canal re-opened in 1975. Both vessels had to be towed out of the canal and discharged, but both went on to trade for several years after. 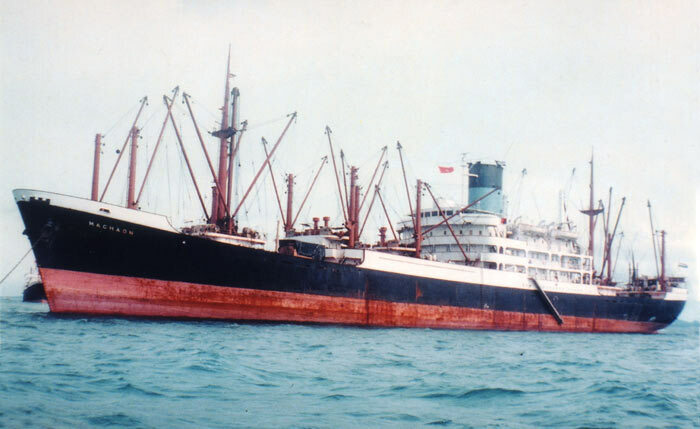 The Agapenor was finally scrapped as the "Nikos" in 1981, and the Maelampus as the "Annoula II" the following year. Quite clearly an eight year Holiday on the Costa Del Bitter Lake, had worked wonders with their life expectancy!!! Colour photos Capt Neville Lester. Menelaus trials and M boat dry-dock Capt Gwilym Owen, All others Mr R Williams Collection.